The key to becoming a great gardener lies much deeper than simply understanding the botanical process of your plants. It's one thing to understand the vegetation and another to recognize the greater system as a whole -- a system that stretches into the depths. To understand this system, you must look beneath the surface, you must look at the soil: soil that supports, enriches, and hydrates your plants. Ensuring the survival and growth of your plants can greatly be determined by your knowledge of the soil your plants rely on. What's down there, anyway? – Soil contains so much more than what is visually perceived. Soil, in its simplicity, is formed by the slow process of erosion and organic decay. This mixture of broken down rock and decayed plant and animal matter is rich in nutrients and minerals. Being an ideal place for plant life, the formation of soil is only promoted by plant growth. As plants attract animals that eventually die, decomposed organic material is added to the soil, further promoting more plant life. Without organic matter, soil would be ill equipped to support any kind of plant growth. Because nutrients are crucial to healthy plant life, it is even more important that you understand the relationship between soil and water. How does water affect the soil? - Since hydration is vital for plant growth, watering is one of the most common gardening tasks. A common misconception, however, is that more water is better. This couldn't be further from the truth. Too much watering can wash away essential nutrients, killing your plants despite watering efforts. Not only does over watering wash away nutrients, but it also destroys soil compaction. 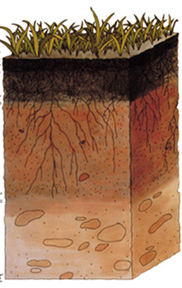 Good soil compaction gives support to the root system, but loose, watery, swampy soil can be detrimental to plant life. Soil either directly promotes or inhibits plant life and water is crucial to growth and survival. Regulate how much water your garden receives by using a timed sprinkler system. Pay attention to the health of your soil to ensure that your plants grow healthy and strong year after year.